Suddenly I see it: a babybox. A device intended for parents who want to relinquish their unwanted child in a way that is responsible and safe for the child. The sign next to it shows in four languages how it works. It’s a nice Tuesday, and I’m walking home. In front of me is Námestí Míru (Peace Square) and the church of St. Ludmila bathed in sunlight. The trees and bushes look beautiful. On my right hand is a municipality office. Just as if it was a depot to drop off packages outside of office hours. I look at the church again in the radiant sunshine. It’s not right! It’s terrible that we need these boxes. That there are mothers who are not able to take care of their children. That they are so desperate that they go find a babybox. 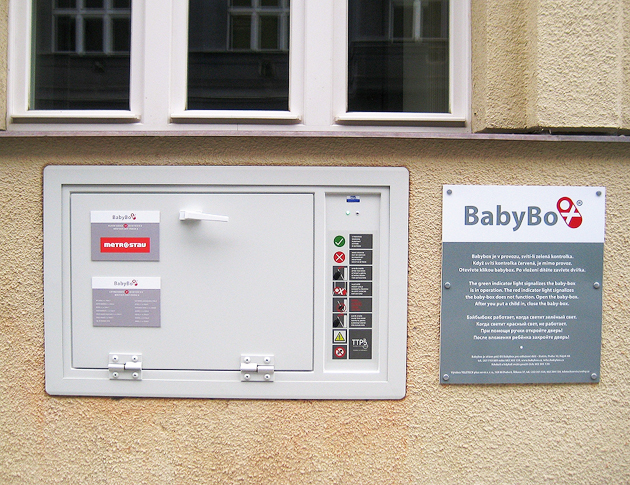 A mother brokenheartedly presses the button to open the box, lays her child in, and then maybe puts a bottle and a nappy next to the baby in a last moment of care. She casts a last torn look at her child, waving its arms and crying, totally unaware of what is happening. Then the mother closes the door of the box. A mother separated from her child forever. I felt tears in my eyes. It’s not right, and yet it happens. I continue my walk in the direction of the church that I have to pass. The nice thing about Námestí Míru is that there are rows and rows of benches. Often people are just sitting there, chatting, reading or eating ice cream. During the summer there is even a piano that passers-by can play on. I walk past the benches and observe the people, one of my very favourite activities. On the last bench sits a man. He’s skewed in the corner; his hoody covers his face almost completely. He is sitting there, motionless, his sleeve rolled up above his elbow. A needle is slowly sliding out of his hand, down along his leg to the ground. No motion. I look at the church again and the beautiful trees. It’s just not right that there are people who try to survive their days from one shot to the next. The desperation when your body is screaming for the next dose of heroine, but you haven’t managed to get it. So much misery in this beautiful city. It’s not right, and yet it is there. I listen to a Psalm. “Raise up your hands and sing, praise the Lord!” I see a babybox with a devastated mother. I see a bench with a desparate drug addict. It’s not right! It’s just not right that I hear this Psalm right now. How can I reconcile this with what I just saw? It looks like a totally different world. But is that true? I think of Jesus. God who left heaven and became a human. He came to this world. His cradle almost a sort of babybox, and He lived in the chaos created by men. He cried with people who were having hard times. He spent time with people, and most of all, with people who were despised by lots of others, for example prostitutes and tax collectors, as well as drug addicts and mothers who cannot take care of their children. Beautifully written! :) Just one thing though-babyboxes aren't really used by mothers that want and love their child-those can find help in specialized centres and shelters. They were developed as a response to many helpless babies thrown away in trashcans, often found dead. THAT's sad. And babyboxes help eliminate these cases. Nevertheless, the story behind babyboxes is still heart-breaking.. And God is still good!